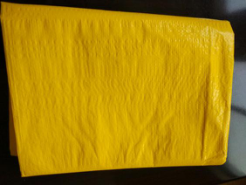 Product categories of Yellow PE Tarpaulin, we are specialized manufacturers from China, Yellow PE Tarpaulin, Yellow PE Tarpaulin Poultry Curtain suppliers/factory, wholesale high-quality products of Waterproof Yellow PE Tarpaulin R & D and manufacturing, we have the perfect after-sales service and technical support. Look forward to your cooperation! 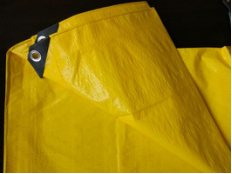 Yellow PE Tarpaulin exports mostly to Brazil market. PE Tarpaulin is generally used to cover things out of doors. Any color can be accepted and adjusted in mass production, such as blue, green, silver, white, black, even camouflage and striped colors. The weights/grammages from 46gsm to 300gsm are all available. Any sizes can be customized, such as 2x3m, 4x5m,... or 4`x6`, 6`x8`,.... or 7x9yard, 16x16yard, etc. We produce both tarp fabrics in rolls and ready made PE tarpaulin sheets. Packing can be made as in bale or in carton as per customers` request. UV Tarpaulin, FR tarpaulin, etc. all can be produced to your needs. Welcome to inquire from us. We surely support you with our best price!